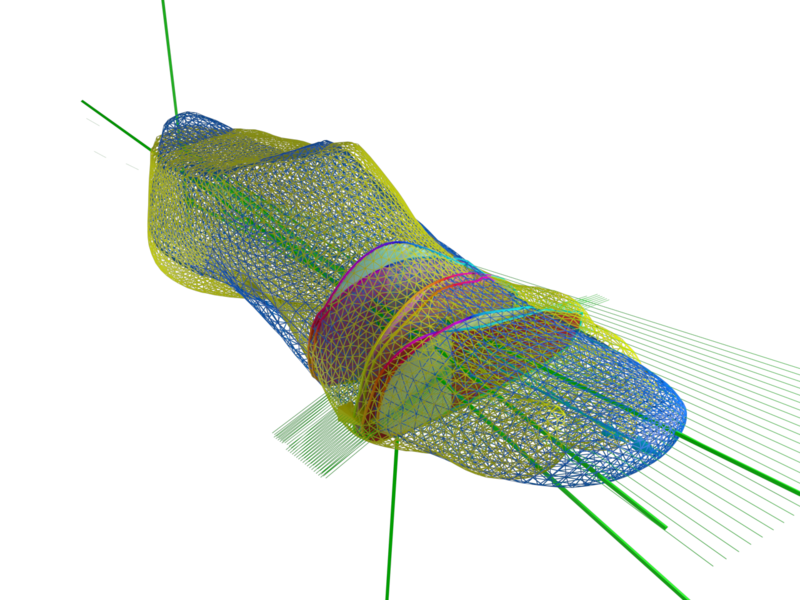 A few years ago I joined 3Dabout.me to build sizing algorithms for 3D scans and apparel. Their idea is to use a 3D scan of your body (or a part of your body) and to match that with scans or size charts of clothing, shoes, helmets, gloves and so on. The algorithm then finds the size matching your 3D scan, you buy the product online and gone are the days of returns! Imagine what it means when any product you buy online fits you because it has been paired with a 3D scan of your own body. First of all you’ll never have to return an item you’ve bought because now it all fits. As a webshop you’re dealing with less returns. Everybody wins! Reliable sizing also opens up new markets for products you just don’t buy online right now: ski boots, orthopedic braces, tailored suits, glasses, prosthetics. Small brands of products like these will be able to expand more easily online. Buying confidence increases when you don’t worry about the right size anymore. While the sound of having a full 3D bodyscan might sound pretty futuristic, it’s likely that this will take off in the coming years. New phones are already coming out with 3D scanning capabilities such as project tango or the Lenovo Phab 2 Pro. You can also have your body scanned in several places to create a 3D printed statue like botspot or scanarama. Fitness studios also start offering 3D scanning to track your training progress: fit3D or styku. I’ve joined 3Dabout.me as a 3D developer. The tasks are very broad but they all have a common goal: develop technology to support the 3Dabout.me vision. I support the founders with core technology, tests, demos, images and videos to explore the feasibility of their business ideas. Here are some of the initial projects I’ve worked on during the last two years. 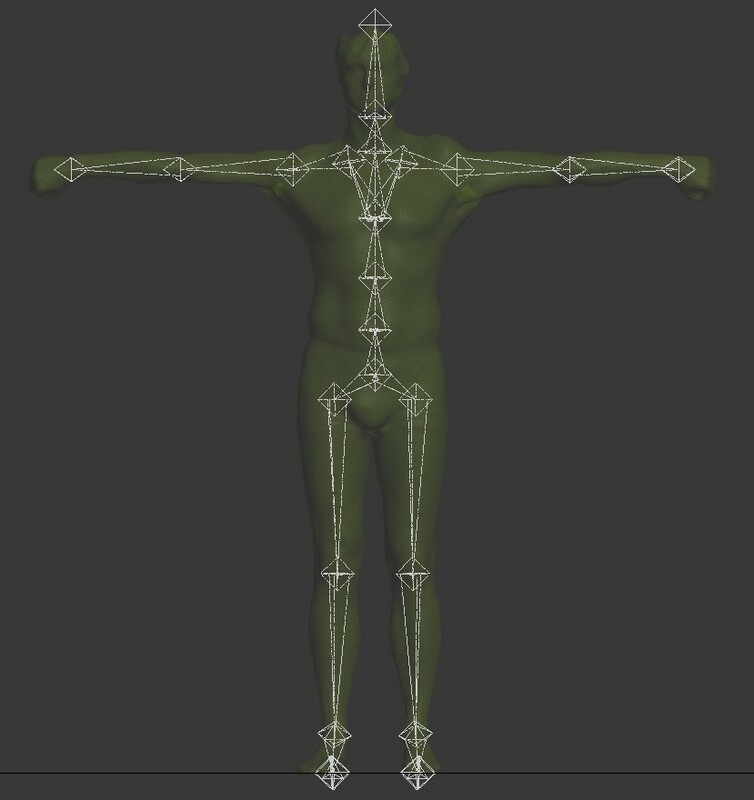 I first got into automated rigging of full body scans using several methods. 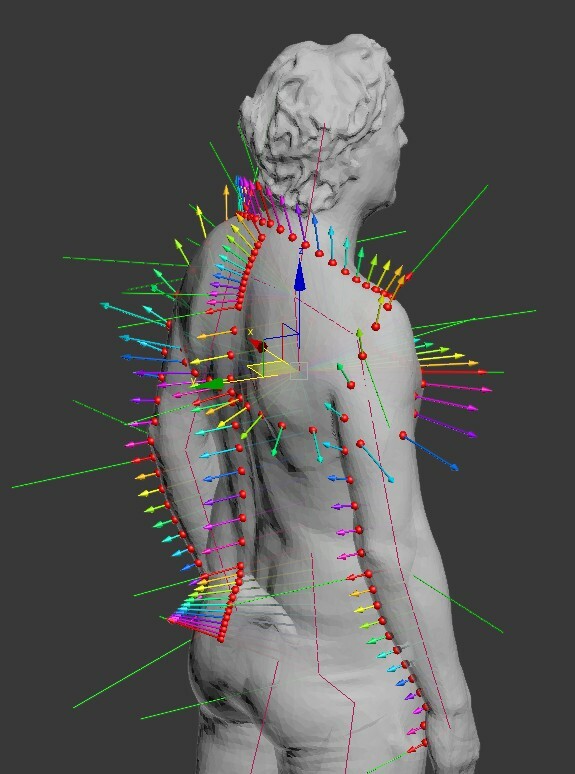 Rigging of a scan means placing a virtual skeleton (rig) in a 3D body scan. 3D game artists do this all the time by hand. The challenge here is to let the computer automatically detect the structure of a body. It has to find key spots in a 3D object such as limbs and joints. For a human this is extremely easy to recognize, for a computer not so much! I’ve explored the possibilities and wrote and connected some software to achieve this with reasonable success. This is definitely an area we’ll come back to. Once the rig is in place, it’s possible to find key positions on the body: landmarks. For instance the point on your shoulder used to measure the width of a shirt. Or the position of the eyebrows to correctly measure the head circumference. I’ve written algorithms for some of these scenarios and I’ve successfully measured lots of scans in an automated manner. Again, landmarks are easy to determine for the (trained) human eye, but the computer first needs to be taught about the human body. Some landmarks are easy to find, but others are much harder. 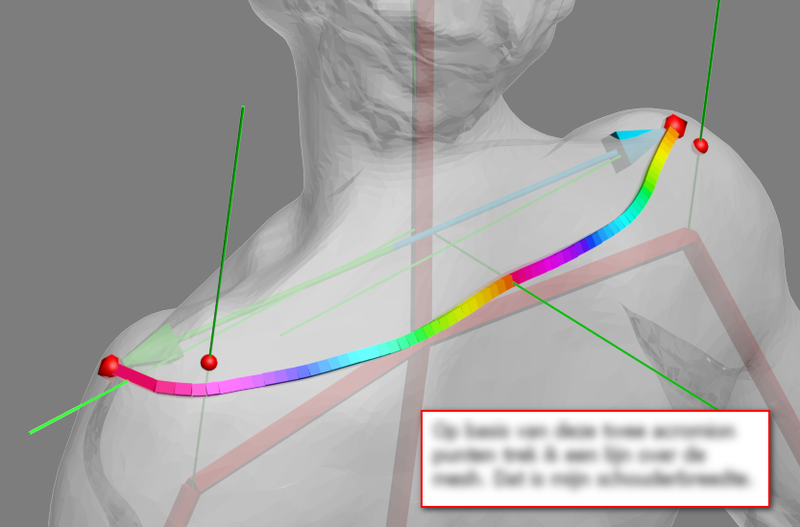 Landmarks on the body and measuring along the surface. After rigging a scan and finding the landmarks it’s possible to start measuring it. We can measure lengths along the body, like a tailor does with a tape measure. It’s also possible to pose the body before measuring such as bending the elbows or raising a knee. With a 3D scan we can go beyond what’s humanly possible to measure on a body, such as the volume of your leg or the surface area of your head. This of course is a great benefit of measuring in a 3D scan. Measuring the body is only one part of the puzzle. We also need to fit a product and find the right size. For example when fitting a bicycle helmet. A fun challenge is to first define what a proper fit is for a helmet and where it should sit on your head. There’s very little literature on that! After defining the proper position of the helmet I can place the 3D helmet on the 3D head. Finally I measure the amount of overlap between head and helmet. Too much overlap: ouch! Too little overlap and the helmet slides off. To find the correct position I use a few key landmarks on the face such as nose, eyes and eyebrows. This helmet clearly doesn’t fit, but by how much? At 3Dabout.me we don’t want to wait for the hardware to catch up to create full bodyscans. It’s already possible to make accurate scans of parts of your body with your phone and an app. 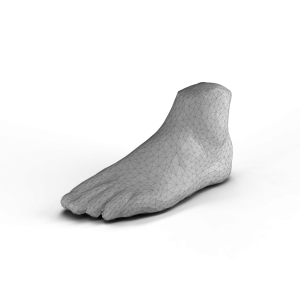 All of the knowledge gathered with the full body scans is now put into algorithms to match feet and shoes. The goal is to completely remove the notion of having a specific shoe size. It doesn’t really matter what size you think you are when 3Dabout.me gets you a fitting shoe every time! While working on this project I noticed how incredibly confusing shoe sizing is. First of all there are the different systems: EU, UK, US and others. Then for US women there’s another size chart. Looking at manufacturers, one brand might size a specific shoe different than another brand. That’s why I don’t have just one shoe size, but it’s 44 for Hanwag, 43 for Nike, 43.5 for Asics and so on. We’re lucky there’s no such thing as vanity sizing for shoes yet! This confusion is exactly the reason why 3dabout.me will be a success. We cut to the chase and fit a digital shoe on your digital foot. You can get the 3Dabout.me app and already purchase shoes matched by 3Dabout.me online. We intend to greatly expand the number of connected brands and shoes. 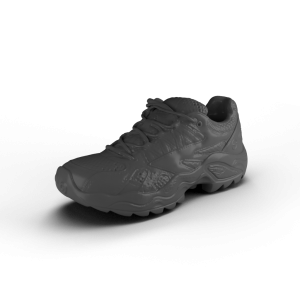 We also are working on adding more shoe types to our software, such as high heels or sandals. You can imagine finding a perfect fit for a dress shoe is quite different than for a pair of flip flops. From now on, you get the right size advice for the shoes you’re looking for, every time! Sounds like science fiction, but it happens, in real time. With our own algorithms we make sure your shoe fits, online. Size related online shopping becomes easy! And this sounds pretty good to me!